There is a really entertaining person to follow on Twitter that goes by the name of Plan Maestro (@PlanMaestro) and he/she publishes a tweet storm every weekend called chartstravaganza. Essentially, it's a series of 20 different charts filled with a variety of data that is equal parts interesting, fun, and irreverent. You know me and my love of data and evidence when it comes to things like this, so I decided I would share some of these great charts with you this week in a new piece called Fun with Charts and Data! I know, super clever. If you have better ideas, I'm all ears. Send me an email with suggestions. I'll likely run one of these pieces every 4 or 5 weeks. Chart #1 this week gives you data in regards to the largest drawdowns the S&P 500 has experienced going back to the Crash of 1929. A drawdown is the total percentage decline from a market top to its ultimate bottom. Complete with the date of the market peak, the total percentage decline, and the length of duration of the drawdown, this chart has it all. It also includes the data for the bull market that preceded the ultimate bear market and pull-back that occurred. Things I think you should take notice of: drawdowns are severe and abrupt, and almost impossible to predict. But look at the data a little more carefully, and you'll notice one very important piece of information: bull markets last longer and expand wealth much more than drawdowns destroy it. As the great Nick Murray likes to say, "stock market losses are temporary, but the gains are permanent." You remember not that long ago when the whole country was outraged about the so-called "1 percenters"? They're the people, of course, that make more money than the other 99% of the population, which is supposed to be comprised of the "normal" people. So what would it take for you to be a "1 percenter" in annual income? 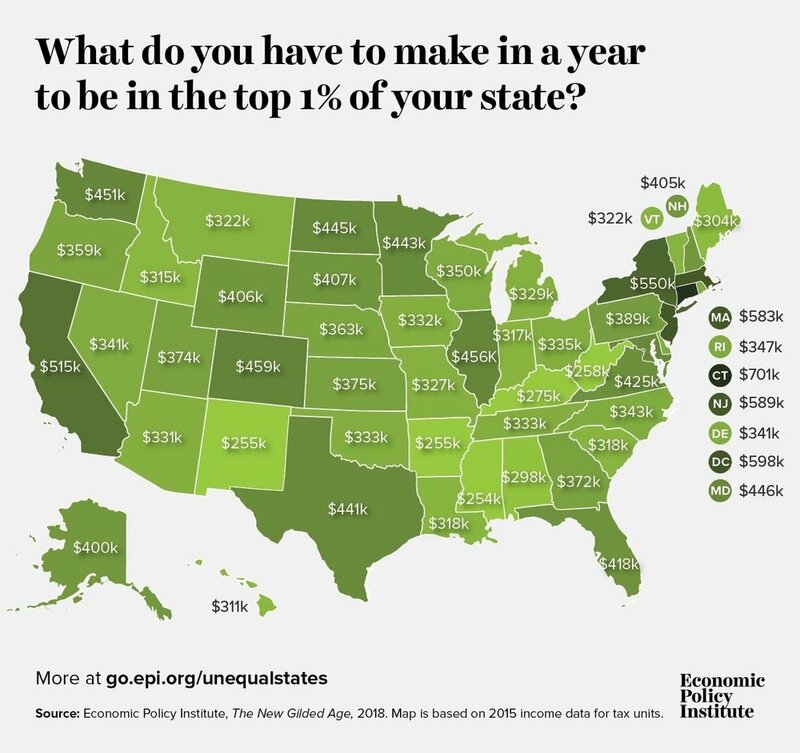 Here's a chart from the Economic Policy Institute showing the dollar amount in annual income, by state, that you would have to earn to make more than the other 99% of the rest of the population. Pretty fascinating. Here in Colorado, that number is $459,000. My reaction? That's a lot of money, at first blush. But honestly, it's not as much as I thought it would be. Clearly, the numbers are going to shoot up in the small sub-section of wage earners that make more money than the other 99%, but when you think about CEOs and professional athletes...it just doesn't seem like as much as I thought. New York and California are also shockingly low, in my opinion. We will file this beauty under the category of "duh", I suppose. Chart #3 this week is showing us the percentage of the American public that trusts the government. We peaked out under Kennedy in the 1960s and then had a hard and dramatic drop until Ronal Reagan was elected. Another solid decline followed by a nice recovery under Clinton, and then down the tubes again. It's probably worth noting that this chart ebbs and flows nicely with economic performance. This chart doesn't need much explanation. Who drinks the most wine by the state they live in? That's it for Episode 1 of Fun with Charts and Data!...as always, thank you for reading. Go be great this week and be kind to someone that needs it most.